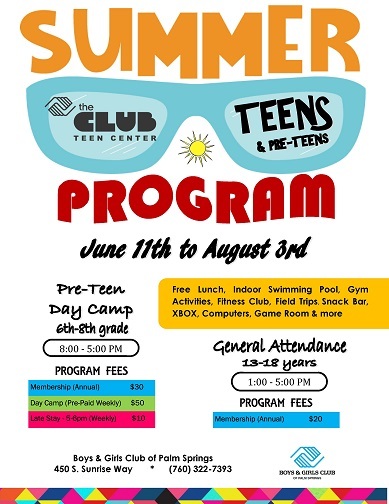 The Boys & Girls Club of Palm Springs’ Mary Bremer Patrick Teen Center is the place to be for teens in Palm Springs. “The Club” offers a diverse program of activities geared for teens ages 13-18. This facility features a computer room, game room complete with pool tables, ping pong and foosball, fitness equipment, snack bar, indoor swimming pool and a gymnasium. The annual membership is $20 per year. Membership forms are needed at the time of renewal. In addition to all of the benefits noted, the Club offers recreational programs such as fitness center, sports, arts & crafts, and field trips. The Club partners with Palm Springs Unified School District and other outside agencies to enhance the opportunities offered to youth. The organization embraces inclusion and the Club’s partnership with UCP allows teen members of special needs to fully participate in Club programs.